We’ve searched different humidifiers around the market and found the Pure Enrichment MistAire to be our pick for the best one. It is powered by ultrasonic waves to spread humidity to the room and it has an automatic shutoff feature for safety, operates quietly and has a night light function for the kids. Our step-up pick for those with a little bit more budget is the TaoTronics Cool Mist and this one also has a timer and adjustable mist levels. It is also ultrasonic and has LED lights for those who are scared of the dark. It also has an automatic shutoff feature to keep it safe from running on low water. If you’re on a tight budget, the VicTsing Cool Mist might be a good choice for you. It can work up to 24 hours straight and is also equipped with an auto-shutoff feature. It is great for bedrooms due to the quiet operation and the LED light which can act as a nightlight. Humidifiers are great for dry climates. A humidifier is a kind of device that helps to add humidity to a room. It is a must-have in climates that have very low humidity or when you feel really dry due to the thin air. It is usually situated on a desk of a bedroom, office or living room and is also usually sleek in design. How it works is basically it sprays vapor or steam to help add humidity to the surrounding air. There are many kinds of humidifiers but the most common now would be the ultrasonic type. This ultrasonic type is very low on noise and usually about only 32 dB, which is hardly audible to the human ears. This can mean a big thing for people who cannot sleep even with a bit of white noise in the background. Such ultrasonic units are also much easier to maintain and clean with no filters needed for them. Humidifiers can help alleviate allergies and dry throat, as well as a number of respiratory problems. If you live in a country in which the climate is very dry, you might find this kind of unit very beneficial to you. It will help to alleviate any dryness of the skin, nose, and throat, and will help a lot to make you feel comfortable at night. The unit helps to add more moisture to the air to make you feel less dry and more refreshed. Babies can sleep better under a good amount of humidity in the air. Such a humidifying device can also be beneficial for baby rooms or nurseries. Babies can fall asleep better and more soundly if they are pampered with the right humidity for the room. They also have a cute design that might complement a baby room or a child’s room as well. Most of them will also have a nightlight function to help children fall asleep better in the dark. Many children are not in very good terms with total darkness and so they need a nightlight at hand, by which this kind of unit can function as a 2 in 1 device for humidifying and illuminating a good night’s sleep. The nightlight may also change in color cycles and can also have a function to lower the brightness to make sure that the brightness levels are okay. The great thing about modern humidifiers today is that they use no expensive filters for you to clean or replace, most likely due to being ultrasonic in design. There are older models out there that have troublesome filters that need to be cleaned or replaced annually, which can cost a lot of $$$ in the long run. Having no filters in the system can save up a lot in terms of expenses. 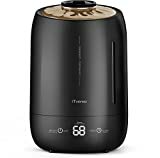 Perhaps the only concern for some people when it comes down to humidifiers is the auto shutoff feature, which not all devices have. The auto shutoff feature determines when the device has run out of the water so that it will not overheat or malfunction. It will also alert you to refill the reservoir with water whenever needed. This is an important safety feature to look for in this unit or device. The capacity of the water tank: the capacity is usually expressed in liters, with most having 3 to 6 liters of capacity. A larger tank would be more ideal to use for an overnight on high mode when the temperature is very dry. Some can even last up to 2 nights continuously if they run on a very large tank or reservoir capacity. Auto shutoff feature: the auto shutoff feature is a crucial part of the device because, without it, the device can potentially overheat or have problems. Its auto shutoff feature can determine when you need to refill the tank or reservoir with water. It will also keep you and your family safe when you run the device on overnight without having to turn it off when it is low on water levels. Type of water allowed: most will allow distilled only but some can also allow filtering. It depends on the brand and the sensitivity, but at the very least it should not be hard water or else the mist will not be pure and bacteria might lurk in the air or mist. You should ask the manufacturer or consult the user instructions, when in doubt, on what kind of liquid is supposed to be used for the unit. Misting directions: the directions of the mist can usually vary between brands. However, a common rule of thumb would be up to 360 degrees of misting as well as 45 degrees of tilting or bending of the misting nozzle. This is crucial to gain a lot of humidity from the unit in all directions in the most effective way. Misting output: the output is usually expressed in milliliters per hour. A higher misting output can be more ideal for larger rooms so that the misting power will be sufficient for everyone. A lower misting output can be more suited to smaller rooms, such as those in apartments, condo units, and dorms. Size of the unit: the size should not be too bulky but should also not compromise on functionality and misting. The size is usually relative to the room as well – bigger units not only take more table space but also help to humidify a bigger sized room. Some larger units are intended for public places. Intended size of the room: this is usually expressed in square meters or square feet. You have to make sure that the size of your room is appropriate or proportional to the power of your unit in terms of misting power per hour. Nightlight: there are some units that will have a nightlight feature. This will be more suitable for children and babies who may have trouble handling the darkness of the night in the room. The nightlight should be easy to adjust for dimming and brightening as well as for color changing. Adjustable mist levels (and light levels): the level of mist should be easy to tweak depending on how much you need in the room. For instance, there should be at least a low and high mode selection for the misting function. That goes the same for the nightlight function if there is one present. This can save not only electrical consumption but also water consumption in the long run. Option for essential oils: you may also want to have an essential oil function for the unit. A humidifier and an essential oil diffuser all in one can be a great thing to have at home. It can be beneficial to people with sinus problems, allergies and those who need essential oils to calm down and stay relaxed while keeping the air misted and away from dryness. If you are looking for the best humidifier around with a balanced price and functionalities, the Pure Enrichment MistAire could be a great choice for you. It has an automatic shut-off for safety when the water levels are very low. It can be placed in a bedroom or nursery and will not take too much space at all. It also has an optional night light for the kids to enjoy sleeping soundly without fear of the dark. This unit has high and low-speed settings so that you can set the misting levels depending on what is needed. It will work in a small room without a lot of power expended and it has 4 settings to choose from when it comes down to the level of humidity. With a 1.5-liter water tank for its capacity, it is pretty decent for most rooms. It can be used for 2 nights before refilling due to its great water tank capacity. This ultrasonic unit is customizable – you can adjust the mist direction up to 360 degrees, which can be ideal for bedrooms that are a little bigger than usual, and if you want the mist to point into a certain direction. It also comes with a little brush to make it easier for you to clean up the unit. The water tank can be easily filled for this unit, which can give you up to 16 hours of continuous operation. This can make it more ideal for offices as well as your own living room. It has a moisture output of 150 milliliters per hour so it is pretty strong in its mist. The cord can be taken out of the unit for easier cleaning, and it also comes with its AC power adapter. With this unit, the Pure Enrichment MistAire, you can use filtered water or distilled water just fine. With no filters at all that need cleaning, you can find it a breeze to maintain this unit, which is backed by a 2-year warranty. The only con but not a deal breaker with the Pure Enrichment MistAire is the fact that its LED can be a bit distracting for someone who prefers a room to be completely dark. As a step-up pick for those who have more budget for more features, the TaoTronics Cool Mist may be a good choice for you. Its tank capacity is at 1.06 gallon or 4 liters so it is pretty okay for its size. The rate of humidity can be adjusted for 3 levels so you can enjoy a more customized misting option. It is also less than 38 dB of noise so it will not distract you at night. With an adjustable vapor to help cater to your needs, the unit is portable, travel-friendly and weighs only 51.9 ounces. It has 2 handles on the top and the bottom so that you can transport it easily and also make refills in the simplest way possible. You can also set the timer for 1 to 24 hours to help you sleep soundly without worrying about the machine running. It bears a modern design which can complement various rooms, such as the living room. It can possibly fill up rooms up to 40 to 50 square meters or 431 to 538 square feet. Working on 110v systems, the compact size takes up less room in any home, such as in the bedroom, especially if your home space is not very big. The LED screen is low on the light so it does not distract you at night, which can be important for those who get distracted by light often. It also has an auto shut-off on low water so that your unit will stay safe. It will also save up on electricity consumption due to the sleep mode. Giving off a strong steam for a dry. winter cold season, it has a 360-degree nozzle to handle all directions as an ultrasonic humidifier. 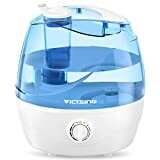 If you don’t have a lot of budget for a good humidifier, the VicTsing Cool Mist can be a great suggestion for you. It can be used all night without having to get up and refill due to the auto shutoff feature. It also produces a very fine mist that does not get everything too wet – just right for those who have a lot of upholstery in their room. With a waterless auto-off, this can make it easier for you to just relax at night without having to refill every now and then or worry about the unit’s safety. What’s more, unlike other types of units out there this one will not make furniture wet or soggy due to the said fine misting action. It is also a bottom filling tank design, as opposed to the top fill design of others. Being BPA-free, it is safe for children and babies due to lacking this kind of harmful chemicals. Its maximum mist output is at >180ml/h, which is pretty strong for a cheaper unit. Running from 12 to 24 hours for its timer, it offers a whisper-quiet operation – perfect for getting a good night’s sleep without being ruined by too much humming noise. There is a mist nozzle that goes up to 45 degrees of tilting and up to 360 degrees of rotation. It has noise levels at 32 dB so it is not very noisy at all, which makes it ideal for sleeping at night or have quiet time at home. With over 2 liters on its tank capacity, it is pretty decent for a budget pick, which can adhere to medium-sized rooms. As a unit that is FCC certified for safety, it is rated for use on 100v-240v so it is okay to take it with you for traveling. Adding to that, it has an anti-slip handle to help you carry it to your destination, especially for a vacation. If you want a top fill style humidifier then you might want to try the VAVA VA-AH017 Top. It has a timer that can be set from 17 to 36 hours of continuous operation for prolonged relief from dryness. It is a top fill humidifier that has a low water protection to keep it safe from overheating and malfunction. The unit also has a wide opening to make it easy to clean. Bearing a modern design, it will look sleek in any room and can accommodate from 107 to 322 sq. ft. of room size in general, producing from 100 to 250 ml per hour of mist output in general. It has a large tank at 4.3 liters or 147 oz. (1 gallon) which can be ideal for such a room size given above – perfect for supplementing medium-sized rooms out there. There are also markings that indicate the water level so you will know when to change and refill the unit. Its dial knob control can make it easy for you to set the settings of the unit while the cleaning brush can help in maintaining the unit’s condition after a long period of use. It has a soft mood light that will not wake you up at night and a low noise to help you sleep, making it ideal for bedrooms and nurseries with children. 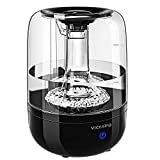 For those who prefer something for baby’s room, the VicTsing Medical Stone is a great pick because of the effective medical stone filter that works to produce natural steam with up to 3 liters of capacity. It has a total of 3 mist modes in its unit settings and it has a maximum mist volume of up to 200 ml/h, which is pretty powerful for a small unit. With a lower noise of 35 dB to help you sleep soundly throughout the night, this ultrasonic vaporizer works up to 14 hours continuously without causing too much noise and without the need to get up at night to refill it due to the auto shutoff feature. What’s more, its tank mouth is big enough for simple cleaning for fewer maintenance problems. The LCD panel is also easy to read but not too bright for nighttime. It is ideal for bedrooms and baby rooms due to the simple design and the 360° rotatable nozzle to direct the steam to your intended area of concern. It can cover up to 322 square feet or 30 square meters of room area and it has anti-leakage properties. Truly effective for a small bedroom, this humidifying machine even has touch button controls to make it simpler to operate. It is backed by a 12-month warranty. The PurSteam Ultrasonic Cool may be more ideal for you if you have a small bedroom, such as in an apartment, condo unit or dorm, or for kids. It has up to 17 hours of operating time on the average and kids’ rooms will greatly benefit from its compact and just-right amount of steam. With an automatic shut-off feature to help you keep track of when to refill the unit, the 2.2-liter water tank can last for a long time and the unit runs really quiet in general. It has a night light function that will help children to sleep soundly in the dark (if they are scared of it) and can be dimmed down when necessary. It has 350 milliliters per hour for its moisture output so it is pretty powerful for such a small unit. Bearing a stylish design, it can be a great bedroom accessory that is less of a hassle of maintenance due to having no filters to clean up at all. With a variable knob control to help you control the steam levels, it even has a low water indicator so you know when to refill the unit. Because you are able to set the humidity levels, it can be suitable for weather changes when humidity levels are not constant. It can be ideal for a 10 x 15 bedroom area as an ultrasonic unit that gives you a whisper-quiet operation to help you sleep better. If you want an ultrasonic style unit, the GENIANI Ultrasonic Cool can be a good choice for any bedroom that uses the 120v system voltage. It is filter-free so it will need less cleaning up and maintenance. Being an ETL certified unit makes this a safe humidifying machine as well. Aside from the bedroom, it can also be ideal for a living room, as well as in baby rooms. You can set its timer for 12 to 24 hours and you can also use its night light feature for children. Don’t worry – the night light can be turned off so you can save up on electricity when not needed. There is a 3-liter water tank that can be ideal for long nights and days of use. Generally, if you want an easy to use unit that requires less maintenance due to the auto shut off feature, this is a good pick. With its 360-degree mist nozzle, so you can direct the mist wherever you desire, it is backed by a 2-year warranty. The Everlasting Comfort Ultrasonic is a perfect choice for those who want an essential oil tray as well, other than the humidifying function. It has up to 6 liters of capacity, which is pretty big for its kind. It has a sleek design so it will complement most bedrooms and even office spaces. A 360-degree nozzle can help you direct the mist to wherever it is needed. The unit is quiet as compared to ambient sounds like rain and noisy neighbors. You also get two color choices: black and white to choose from and you can change the direction of the output using the said nozzle above. Ideal for rooms up to 400 sq. feet, it can be used for 50 straight hours without the need for refilling. With a 270 ml/hr of mist output that is pretty strong, it is also made with a blue LED nightlight for the kids to feel safe at night. It can help alleviate irritated skin with its fine misting capabilities without getting too soggy. The auto shut off feature can help you monitor the levels of the liquid and it is also easy to fill due to the wide design. The power knob can adjust the amount of mist to save up on water usage and with no expensive filters needed, maintenance can be a breeze with this unit. It is backed by a 2-year warranty. The iTvanila Cool Mist is a unique unit that has a temperature display so that you will know when to use it and how the mist can affect the temperature indoors. There are 3 levels of mist that you can choose from depending on how much humidity you need at home. Its digital temperature display can prove to be useful in situations when you don’t know the current temperature. Its auto shut-off feature does the same with all humidifiers – to ensure safety in its operation on low water levels. Its 360-degree rotatable nozzle also does the same thing with other ultrasonic units – to direct mist in the right way. The included light can turn off in sleep mode so it will not distract you in the middle of the darkness. With no expensive filter needed, the iTvanila Cool Mist can take up to 5 liters or 1.32 gallons of water in its reservoir. If you live in a very dry climate, this unit can handle 12 to 45 hours of continuous usage with a large volume of water for its tank, while maintaining a whisper quiet operation throughout the night. The URPOWER Square Aromatherapy is a great unit that can be a nightlight for children who are scared of the dark. It can run for more than 20 hours so it is pretty lengthy and longer lasting than other units, while its LED lights can cycle to 7 colors for added aesthetics. Not to worry about distracting lights – the brightness can be adjusted on the unit. It can also act as an essential oil diffuser for those who want to put their lemon oils and the like. The size is just right for most bedrooms, bearing a sleek design, and is a great nightlight for big rooms in general. 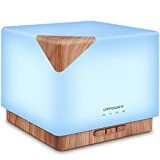 With an automatically power off when low on water, the URPOWER Square features 700 ml of capacity with two modes: low (30 to 45 ml/h) and high (40 to 70 ml/h) mist mode. Its motor generally operates up to 10 hours straight on low mode and 20 hours on high mode. Not to worry about setup – the unit comes with good user directions. 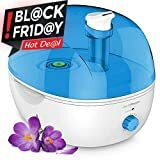 There were other humidifiers that did not make it to our list because they had reports of having no low water protection at all, which is crucial for any humidifier. It should also be space-saving and at the same time, has a timer, otherwise, it will not be a convenient humidifier to leave on at night. Q: What are the different benefits of using a humidifier? Improved skin quality Dry skin is caused by a lack of humidity. Therefore, it is important to keep your skin hydrated with the right amount of humidity at home. Soothe sore throats A sore throat is another effect of a dry climate, and humidity can fix that problem. 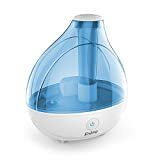 Keeps away from respiratory diseases Most respiratory diseases are caused by dry air as well, so it pays to have a humidifier at home if you’re prone to such illnesses. Better recovery If you’re stuck with any illness, there is a better chance of recovery if your climate is slightly more humid. Reduces allergens Allergens can easily spread if your climate is dry, so it pays to have a little bit more humidity at home. Prevents asthma triggers Asthma is also caused by dry air, so it really benefits asthma sufferers to have a humidifier at home. Reduces headache instances Headaches can also be caused by a very dry air, so it helps to add a little humidity at home. Prevents dry eyes Dry eyes are caused by lack of moisture in the air, especially if you run the A/C on all day. By adding humidity, it will prevent your eyes from getting dry and irritated as well. Good for houseplants Because houseplants may die or wilt if they are lacking in moisture, it pays to have a good humidity level at home with a humidifier. Great for children Because children are more prone to sickness caused by dry climate, having a humidifier at home can help them feel relief from such sicknesses. 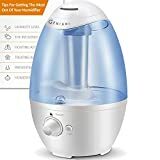 Keeps your voice quality in good shape Especially for singers and those who use their voice for their job nature, your voice can be affected by a dry climate, so it pays to have a humidifier at home for that. Q: Aside from humidifiers, what other ways can help fight the effects of dry air? Drinking water regularly can help fight the effects of dry air. Lessen your showers so that your skin will not be excessively dry. Drink more fluids to help keep your skin hydrated and healthy. Add a moisturizer product after bathing or washing. Use nasal irrigation products if your nose gets excessively dry. A: Can you run a humidifier without a filter? A: If you have a humidifier that is evaporative then it really needs a filter. However, for ultrasonic models and newer products of the same kind, they might not have a filter in their system, which makes it easier to clean overall. Q: What are the three types of humidifiers? Ultrasonic Ultrasonic ones are the most common in the market. They are the quietest and are also maintenance-free due to not having a filter at most. They have a very fine mist but you should watch for white dust in some older models of the ultrasonic unit. Evaporative Evaporative ones are great for cool misting, much like the ultrasonic one. The only difference is that it uses a fan mechanism and it does not create white dust at all. It is a little bit more expensive. Steam-based If you want to disinfect your home from bacteria and germs, the steam-based unit would be the best for you. It, however, requires more cleaning and maintenance due to the filters needed. Q: What are the bad effects of dry air? Sore throat is a common effect of dry climate. Q: Where is the best place to put a humidifier? A common place for humidifiers would be a bedroom. Q: What’s the difference between an air purifier and a humidifier? Q: How much humidity is recommended at home? A: The ideal humidity levels you should set at home is about 30% to 50%. If your humidity levels are above 50% then it can be a great risk for mold. If it is below 30% then it can cause sicknesses and irritations related to dry climates. Q: How is a humidifier different from a dehumidifier? A humidifier adds more moisture in the air. This is more suitable for climates that are dry, such as in northern regions of the world, as well as in dry deserts of the Middle East. A dehumidifier reduces the moisture in the air. This is more suitable for climates that are very humid, such as near the beach, tropical areas, rainforests and anywhere where mold is likely to happen. Q: How is an essential oil diffuser different from a humidifier? Q: Can mold grow in a humidifier? Mold is likely to grow if humidity is too high. A: In most cases, humidifiers can also have mold, but it depends on the brand that you have. There are certainly better-priced ones that have an antimicrobial agent to keep mold at bay without the need to clean it more often. Q: Is it important to maintain the humidity of your guitar? Guitars can be in danger when not kept in the right humidity. A: Yes, that’s why guitar humidifiers and dehumidifiers exist for that purpose. Humidity can cause not only mold but also corrosion, which can ruin your musical instrument’s metal parts, especially the strings. Therefore, when storing your guitar, make sure it is in a room with the right amount of humidity to avoid these problems from occurring. Q: What are the ways you can improve the air quality in your home? Proper ventilation Add more windows, open up more spaces and make sure there’s enough ventilation at home. Sealing The walls and floors of your home should be properly sealed to avoid leaking of outdoor contaminants. Under-floor ventilation This may help you if you are afraid of radon levels at home increasing. Radon pump system If you believe that the radon levels in your home have been tested to be high, this is a good investment for you. Q: How often do I need to clean my humidifier? A: Whether you have one that has a filter or not, cleaning it is a must to avoid the buildup of mold, mildew, bacteria, germs, dust, and dirt. The recommended time for cleaning this unit is about every 1 to 2 weeks depending on how much you use the unit. Q: How do I fill up water on this unit? Q: Can a humidifier humidify the whole house? A: Yes, there are specific humidifiers that are powerful enough to add moisture to the whole house. This is suitable if your climate is very dry and your house really needs enough moisture in the air, especially if you have kids and people who suffer the most with a sore throat or allergies. Q: Aside from investing in a humidifier, what are other ways to help sufferers of allergic rhinitis? People suffering from allergic rhinitis need good room humidity levels. Allergen control Clean stuffed toys, bedding, upholstery and various sources of dust and allergens at home. Clean pets Make sure you wash your pets often to avoid spreading pet dander. Air filters Add an air filter or purifier, specifically one with a HEPA filter, to help clean your home. Gardening If you have a garden or lawn, make sure it is properly maintained to avoid spreading of pollen too much. Avoid pollen season Make sure you’re prepared for pollen season such as springtime by wearing masks or timing your trip. Get OTC medicine Over the counter meds that have antihistamine are usually available in most drugstores and they can help alleviate sufferers of allergic rhinitis – just take them at night because they can cause drowsiness. Q: If I already have an A/C unit, why do I need a humidifier? Humidifiers can help add humidity to the air, while A/Cs make the air dry. Not all A/C units have a humidifying function. Q: Should I have an aromatherapy diffuser alongside a humidifier? Aromatherapy and humidity can be combined together for healthier indoor air. A: In most cases, yes, they can be combined together. There are also some units that are both humidifiers and aromatherapy diffusers for added convenience. This is helpful for those with a dry climate and wants to have a fresh feeling in their home in terms of air quality. Q: Which parts of a humidifier needs to be only fixed by a professional? To wrap up our humidifiers list, we think that the Pure Enrichment MistAire is our best recommendation. Its nightlight can be beneficial for kids, the ultrasonic waves are quiet and the automatic shutoff can help save the unit from malfunctioning or causing fires/spark at home to protect you from low-water incidents. Thanks for all your effort to find out which humidifier is the best one. I really appreciate it. It really helped me to buy the best one in the market. I learned that what kind of feature it should have. Which material it should be made of. I feel much more comfortable with it.